Q: I’ve decided to start wearing a helmet after going without for many years. Helmets are a lot different now than when I was a kid! How do I find the right helmet, and how do I know if it fits correctly? A: Congratulations! You’ve made a smart choice. Equestrian helmets are no longer just for jumpers and jockeys, and you’ll find styles to suit every need. Today, hunter/jumpers have updated styles with cutting-edge features for optimal ventilation and fit. Western riders can opt for the western hat/helmet hybrids, or newer helmets that are made with western accents to fit the style. If you ride primarily on trails or just for pleasure, seek out a light-colored, ventilated schooling helmet. It will keep your head cool and this type of helmet is typically quite inexpensive. Of course, if you still love the classics, you can go for the black velvet helmet that looks much like the old hunt caps with the added benefit of actually protecting your head! You can measure your head with a tape measure to approximate your helmet size if you plan to order online or from a catalog. However, your head shape will affect your helmet size, so it’s best to actually visit your local tack shop and try on a few different brands and models of helmet to find the size and shape that will work for you. When you try on a helmet, wear your hair the way you will usually have it when you’re riding. If you’re shopping for a show helmet, this may mean bringing along a hairnet and putting your hair up under the helmet. When you put on the helmet, it should fit snugly. Shake your head side to side and up and down. If the helmet moves at all, it’s too big. Try to slide it back and forth on your head. It should not slide easily. You want your helmet to stay pretty much in place if it comes into contact with an immovable object. Of course, you don’t want to feel like your head is in a vice grip, either. If the helmet gives you a headache or leaves a red mark after a few minutes, it’s probably too small. 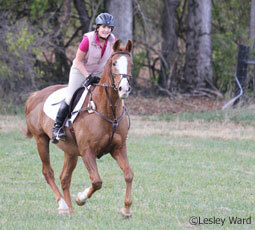 If you’re accustomed to wearing a bicycle helmet, an equestrian helmet may feel strange at first. Riding helmets are designed to fit lower than bike helmets, so keep that in mind during the fitting process. I will just add, though, that when using a helmet with a gpa dial, make sure it is all the way loose before you put on the helmet. Then, once you have the helmet on your head, tighten it so that you feel a resistance when you try to pull up the helmet off your head. If it slips off when you have it all the way tight, then the helmet must be too large. Is there any way we can petition the helmet makers to make a top hat/helmet combination for upper lever dressage competitions? They make combinations for saddle seat and western just not us dressage lovers? I am autistic so my brain already is messed up in a way and I don’t need it or want it messed up from riding with out proper precautions. I have heard of one famous dressage rider already hospitalized for not riding without a helmet. 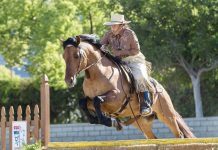 Sending this link for the 4-Hers in Horsemanship. I agree, Great advise. Andrea: In the current USEF Dressage rulebook, ‘protective headgear’ is allowed at all levels, and they SAY, anyways, that the rider will not be penalized (discriminated against?) for it. You’re right though; someone should start making them, especially after King-Dyes accident. If you haven’t already, you might want to check out Troxel’s derby helmet (not the same as a top hat, of course) and there’s an article on Equisearch about a dressage rider that managed to get a custom top hat cover and put it on a low-profile helmet base–probably a very pricey option.